historical fiction. June is the sixth month we’ve been doing this fiction stuff – and it will be our last. After June, we’re going to transition into other topics, like how to self-publish and finding an agent. We’ll also talk about online marketing and email lists and appearances. So this will be our last blog about actual writing. 5.) Print out and read your book. All three of these activities are essential to meaningful re-writes. A critique group will help you see you’re writing from your readers’ eyes. Things that look awesome to you, will read confused and disorganized to them. In addition, things you think are pedestrian in your writing will instill hope and inspiration to others. Some people might weep. (I’ve seen it happen.) Please join a critique group and take their criticisms to heart. Remember, author Jeff Goins says art needs and audience. Get a book on grammar. English has more than 100,000 words in it. Its origins are wacky. 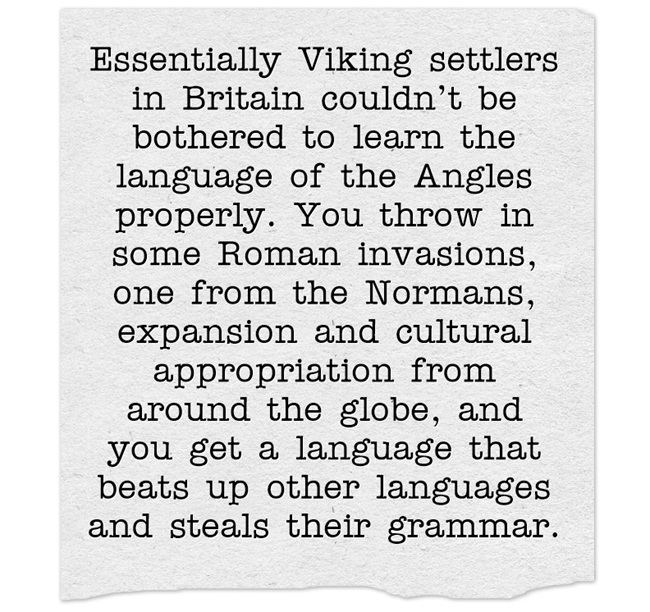 Essentially Viking settlers in Britain couldn’t be bothered to learn the language of the Angles properly. 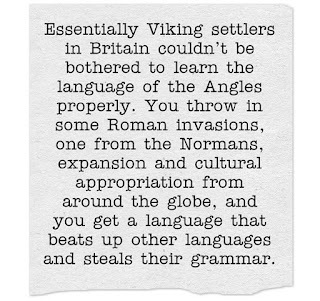 You throw in some Roman invasions, one from the Normans, expansion and cultural appropriation from around the globe, and you get a language that beats up other languages and steals their grammar. So, again, Get a book on grammar. No one expects you to know everything about English. It’s a process. But you can’t start that process without a primer on the basics. A book on grammar can help. Finally, print out your book and read it out loud. The sound of actual words will help clean up sentence structure. You can also make notes right in the margin. I looked around on the internet and came across multiple definitions for the same terms. So I’ll clarify as I write. You, the writer, before you hire an editor or query to Penguin Books, must do these three kinds of edits yourself. These have to do with that pesky grammar stuff – and it’s hard, at least for me. 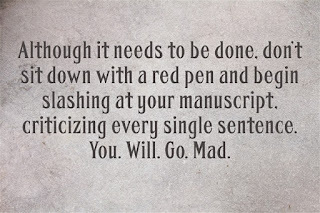 Although it needs to be done, don’t sit down with a red pen and begin slashing at your manuscript, criticizing every single sentence. You. Will. Go. Mad. Every critique group has a grammar Nazi in it – at least the good ones do. They will let you know about the minutia of grammar. They will tell you things you wouldn’t pick up in a decent book of grammar. As they slash your ten pages, you take notes and learn what rules you keep breaking. When you begin your structure edit, you will notice the bad grammar habits you’ve picked up. Note and correct them there. Then, and only then, do you do a read through looking only for grammar mistakes. For me, structure edits are about asking certain questions of my work and figuring out how to make them better. So, as you read through your W.I.P. (after taking at least two weeks off without looking at it,) ask yourself these critical questions. Is the protagonist’s motivation painfully obvious? Is the protagonist likeable? Do you want them to be? Do you have a theme? If so, is the theme obvious to your readers? Does your protagonist have a story arc? Is it clear and obvious? 5 Do any of your supporting characters have a story arc? Are their arcs clear and obvious? Is your protagonist the cause of at least some of his own troubles? If not, why? If so, can he fix them? At the midpoint of the W.I.P., is the protagonist able to reflect upon his or her decisions? Is there a whiff of death in the second half of Act 2? Is there at least a partially satisfying conclusion for your reader? Do the good guys win? 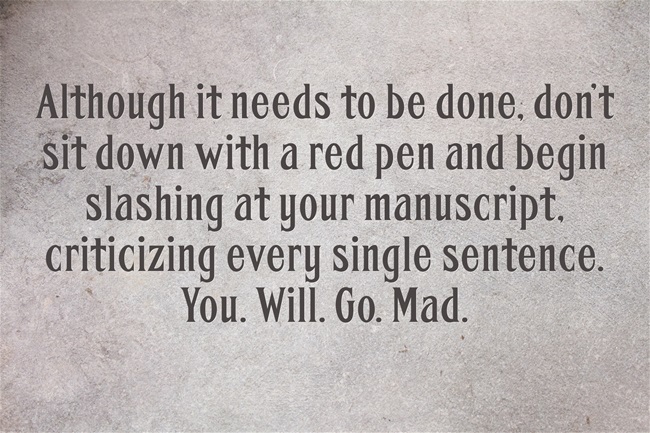 If not, is there something satisfying for your reader to grab ahold of at the end of your W.I.P.? When you come to the realization that you need to re-write some scenes – or add new scenes, please, please, please, open of a new file and keep those scenes there! Keep them separate from your W.I.P. Don’t go deleting stuff willy-nilly all over your book. Do your re-writes and slowly integrate them into brand new copies. When I was finished with The Gallowglass, a novel about English soldiers fighting in the Irish Nine Years War, I realized I needed a love story. So I organized one, outlining the scenes I would use. Now, I use MS Word, so I created a separate file folder within my book file folder and called it “Gallowglass Romance.” I made individual word files for every extra scene. You, however, don’t have to do that. You can string them along in one .doc, if you so choose, depending on the length of your scenes. I added an intro for the extra character. An argument scene. I added a dinner alone together scene. All in all, I wrote 11 extra scenes for my romantic subplot and kept them separate. Then, I went back and added them to appropriate chapters. But I also have that separate romance file – just in case I need to move them again. Do you remember back in April when I said don’t worry about the minutia of the historical accuracy stuff when writing your draft? Just add brackets with [Do specific research later]? Well, it’s time to worry about that stuff. This will be the hardest part. You’ll have to research where historical characters physically were. The slang they used, the clothing they wore, even the medicine they had access to. Start with the big stuff first. If your novel is about a famous historical figure, I really hope you created an outline of the figure’s whereabouts before you wrote your book. If you didn’t, you’ll have to do some major re-writes. Are your characters in the middle of a major historical event, like the Battle of the Bulge, or the coronation of Kaiser Willhelm I? Then you’ll need maps, pictures (if available,) and probably a spreadsheet of historical characters your protagonist will interact with. If your story takes place in one of those forgotten spaces in history, you will still need to learn about eating habits, sexual norms, fashions, and etiquette. These are the details that will make your manuscript glow. These are also the points that will trip your story up to readers and agents if you get them wrong. The great news is that the internet has access to all of this information. The bad news is that the internet is the Wild West, and you’ll have to use your judgment. Back in November of 2015 I realized that my W.I.P., The Gallowglass, was awful. Just plain bad. So I made the decision to do a re-write from page one. I literally could not use anything from the first draft, it was so bad. As I sat there, heartbroken around Thanksgiving about all the work I was about to do, I realized something. As hard as I thought it was going to be, I knew I had a story in me. I knew it was a good story, a story people would want to read. I also knew there was no real physical work to do. I wasn’t shoveling horse manure in the hot Missouri summer sun. Re-writing this story, my story, wasn’t going to be that hard. I could do this. So I did. It took three months, off and on, to finish my second draft. I did it, and so can you. Go on Facebook and like my Author Page.